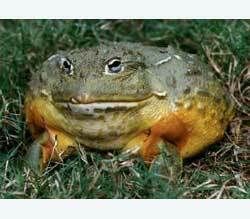 The African bullfrogs, or pyxies, are not an overly active species, and captives do not require particularly large terraria. A small African bullfrog can be maintained in a 5-gallon aquarium, a medium frog in a 10-gallon aquarium and a large frog in a 20-gallon long aquarium. Captive specimens may be maintained either terrestrially, or in an inch of water. African bullfrogs, or pyxies, do well in either set-up, but are less prone to obesity in the terrarium set-up where they burrow in the soil and emerge only when they are hungry. Water set-ups require frequent (if not daily) cleaning, as bacteria proliferate in this type of terrarium. Adult African bullfrogs will eagerly accept prey up to the size of adult mice and small rats, care should be taken when feeding as they will also eagerly accept the fingers of those proffering the meal.